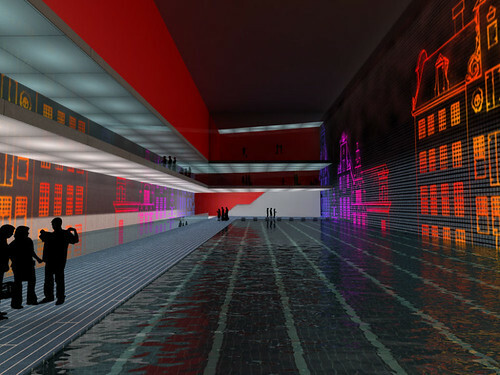 Will the city of Amsterdam soon build "a labyrinth city" beneath its canals? According to World Architecture News, "Newspapers around Europe have been reporting on the scheme, which requires the city's canals to be drained to allow the construction of a vast underground mixed-use complex beneath." 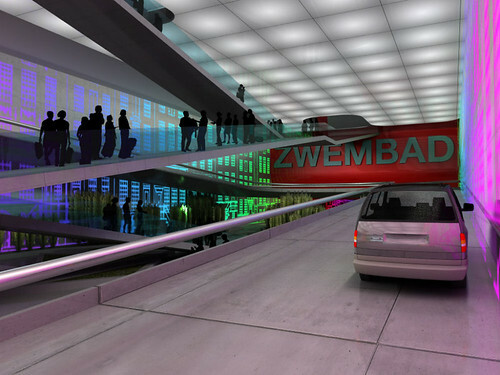 It's an idea by Zwarts & Jansma architects, whose plans includes excavating "a range of underground facilities... at various levels below the city." 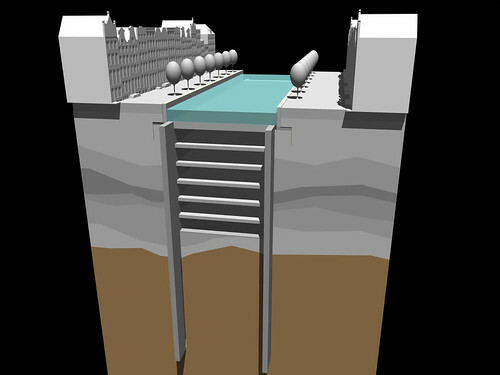 The Dutch capital may be unique as its geology lends itself to the technical feasibility of this scheme. Moshé Zwarts explained, "Amsterdam sites on a 30-metre layer of waterproof clay which will be used together with concrete and sand to make new walls. Once we have resealed the canal floor, we will be able to carry on working underneath while pouring water back into the canals. It's an easy technique and it doesn't create issues with drilling noises on the streets." But does that mean Amsterdam should really build it? For instance, World Architecture News is quite opposed to the project – yet the Telegraph reports that "the project has been approved by Amsterdam's city council. Construction work, lasting up to 20 years, is expected to begin in 2018." 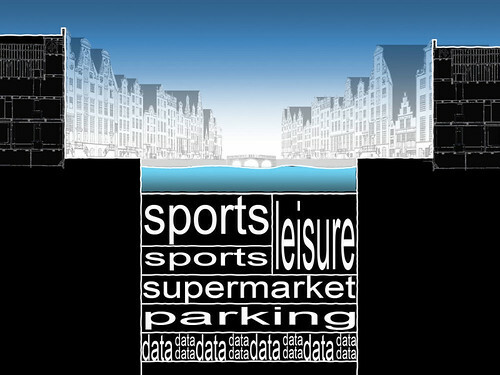 Hopefully the plan isn't to build a huge underground parking garage, as some of the images seem to suggest. Hate to burst any bubbles here, but I think the Telegraph is misinformed on the plans (or they know something which the rest of Holland doesn't). The city council has expressed reserves about the plans and does not think it fits in with their plans for the future of the city. For now, these are just the wild wet dreams of Strukton, the company who presented the plans. No bubbles burst - the idea seems completely absurd to me. I just like underground cities... But the project seems like forced creativity to me, and, to some extent, like a media stunt. As a resident in amsterdam, I'd say cars are one of the major annoyances I have to face on a dailey basis. 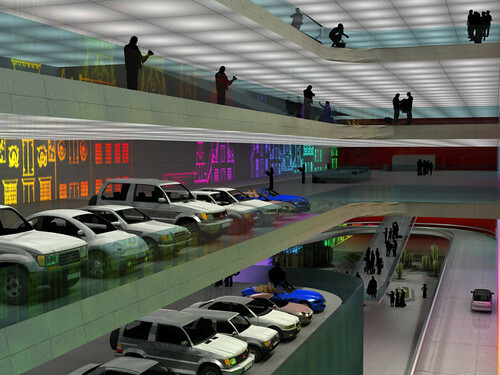 So the idea of huge underground parking garages doesn't sound so bad to me actually, it would create a lot if space in the small cannal streets, plus it might reduce noise and pollutants from cars within the city. I hope they don't built it... I have been in a kind of underground mall in Paris and it was a bit claustrophobic. This would be the same or even worst, because there is water above you. I had to take them down for a few hours because my RSS feed wasn't feeding right... But I'm glad you missed them! Means at least someone finds them useful. Well it is absolutely obvious the Telegraph is overimaginative - I think anybody can see that (and as others stated before, no Dutch sources have mentioned this at all, and obviously it wasn't taken very seriously anyway). But assume we have to see it more as a 'concept-project' - like a concept-car, partly a media stunt and partly exploring new possibilities (which might be a very typical (and valuable) aspect of a Dutch approach to problems anyway). But especially looking at it from this angle it is incredible to see this office showing so little understanding of the issue they try to approach - however Koolhaas concept of 'culture of congestion' might be debatable in many cases - stating the most effective way of killing urbanity would be solving it's congestion - the very one city I would say it is undoubtly true for would be Amsterdam. 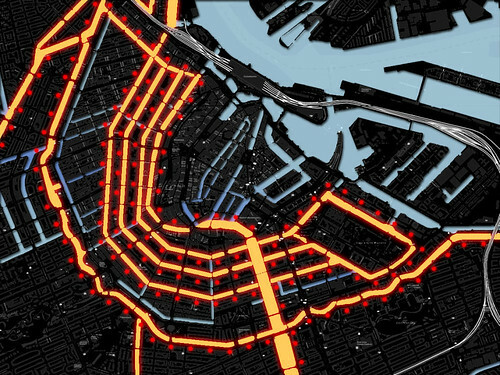 The situation that it is inpossible to drive, own or park a car virtually anywhere in Amsterdam (Amsterdam is simply optimised on the axiradius of bikes) - is the very reason of it's extraordinary urbanity. And the great thing is that it does not significantly decrease the mobility of the inhabitants, nor does it increase treir travel-time - it just simply is a more favourable balance. Really, I couldn't imagine a worse sollution for a rather non-existent problem. It seems like it wouldn't add to the city so much as create a new city underneath, with its own patterns and rules. If rising sea levels ever rendered the existing city uninhabitable, though, inherently watertight structures below or (well) above ground would be the only habitable places left in the vicinity. That makes me think. Well were are talking about the low country after all right. So, it's not inconceivable that what could be is an invisible city, from the surface, excepting a few snorkels. You would pull in to the city on a boat, get off on the top floor of the tallest building poking just above the surface and look all around. What you see are some tubes and lights and a couple barge-like quais. And the vast Atlantic seaboard lagoon that is what was the Netherlands stretches to the horizon, with glimpses of dikes. This strikes me as a bad idea. Holland is already struggling with the sea, and climate change won't likely make their fight any easier. ...So what better idea than to dig down? Hello water table? Seems implausible and technically not feasible.